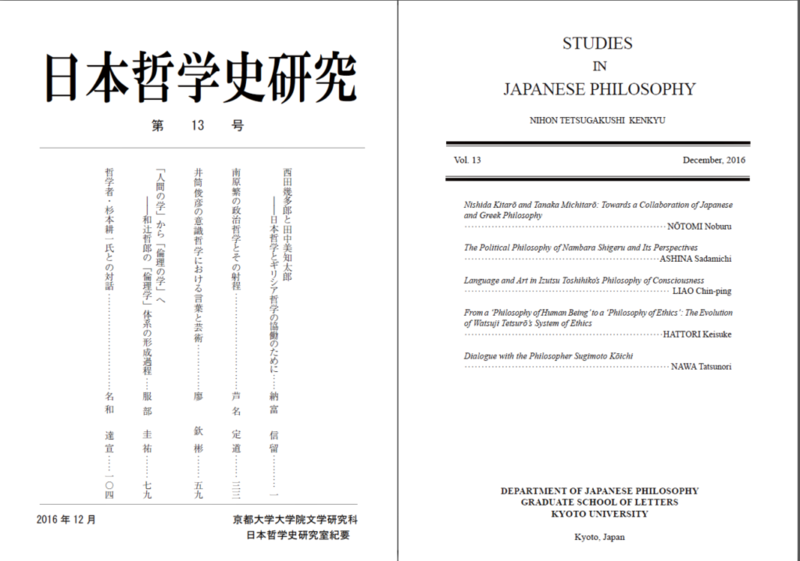 Tetsugaku, the International e-Journal of the Philosophical Association of Japan, calls for papers for the special issue, “Japanese Philosophy” (Vol. 3, 2019). 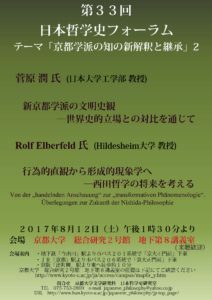 From the war years onwards, research in Japanese philosophy has been closely tied to the thinking of the Kyoto School. However, this still young academic field has enjoyed significant growth in recent years, particularly abroad. 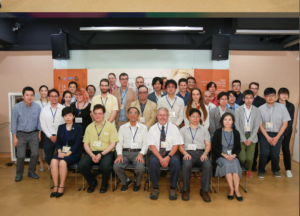 Today, we see the development of a variety of approaches, as well as an increasing amount of research focusing on topics other than the Kyoto School. To submit your paper, please read carefully our Guidelines for Contributors. Von der „handelnden Anschauung“ zur „transformativen Phänomenologie“. 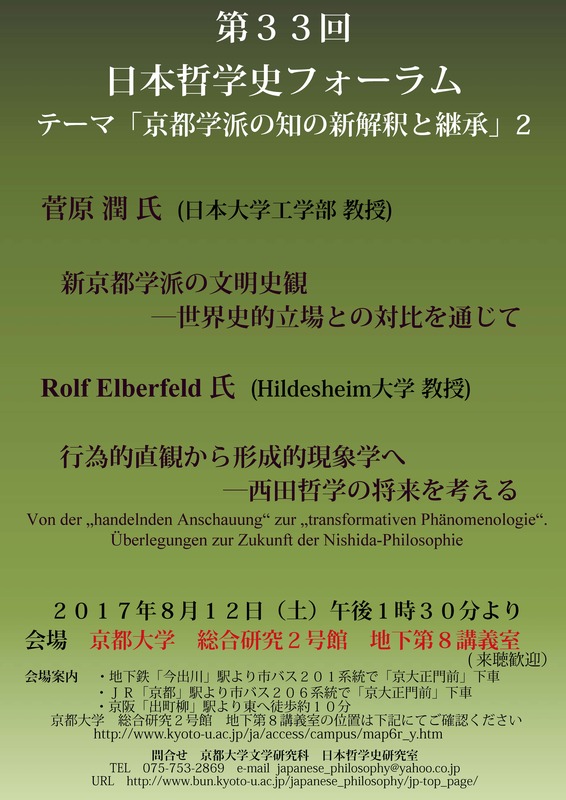 This second annual international conference for IAJP aims at 1) further reinforcing Japanese philosophy as a global academic discipline; 2) exploring the potential of Japanese philosophy in its interface with the various philosophical traditions of East Asia, including, but not limited to, Confucianism, Buddhism and Daoism; and 3) developing a solid research network within East Asia for the field of Japanese philosophy in order to facilitate its promotion across the world. 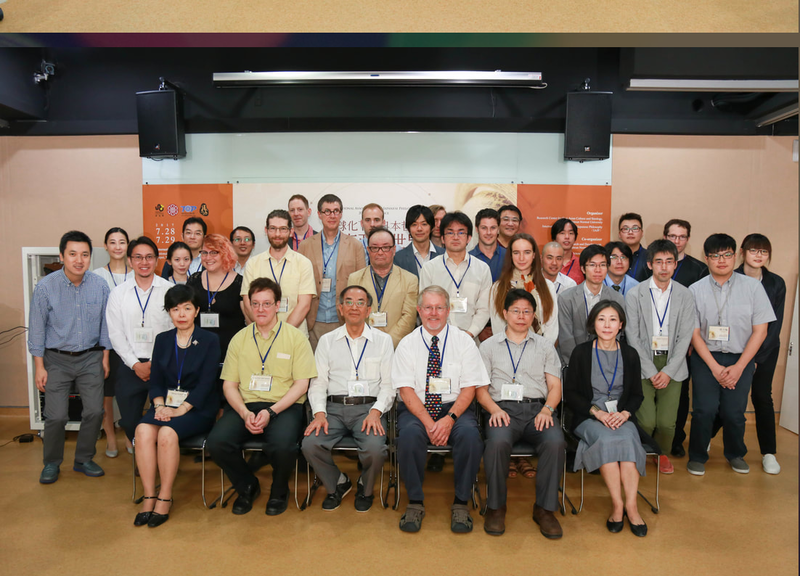 Riding on the wave of the very successful first international meeting of IAJP in 2016, IAJP’s second international conference will continue the promotion and development of Japanese philosophy globally. 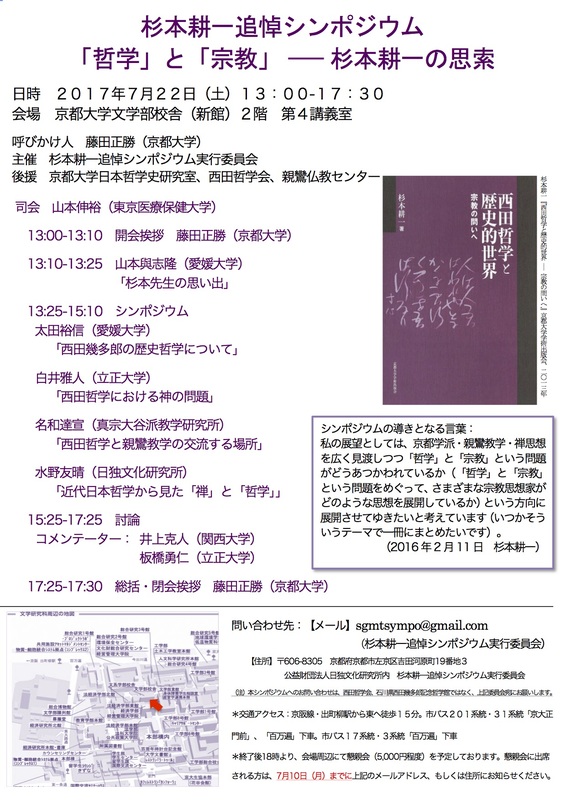 Although the reception of and confrontation with Western philosophy remains on the agenda of the 2017 conference, the IAJP also seeks to explore the comparatively underdeveloped but indeed important connection between Japanese philosophy and the philosophical traditions of East Asia. 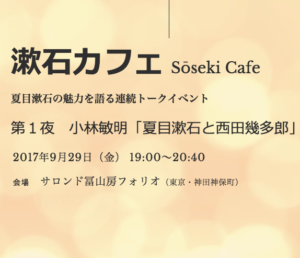 The philosophical and cultural diversity that Taiwan embraces will definitely provide conference participants an opportunity for inspiring intellectual exchange involving the people of Taiwan and scholars of Japanese philosophy from East Asia as well as other parts of the world. 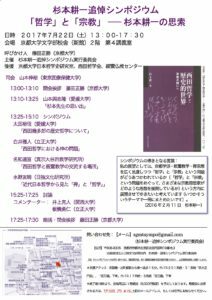 This conference welcomes proposals for critical and insightful presentations that challenge the study of Japanese philosophy through a re-reading and reconfiguring of related philosophical texts and issues, from the perspectives of Western as well as Eastern philosophical traditions. This conference specifically encourages young scholars to submit their proposals. Topics may cover any period, figure, or context pertaining to Japanese philosophy and thought. This conference invites proposals for organized panels and individual papers. 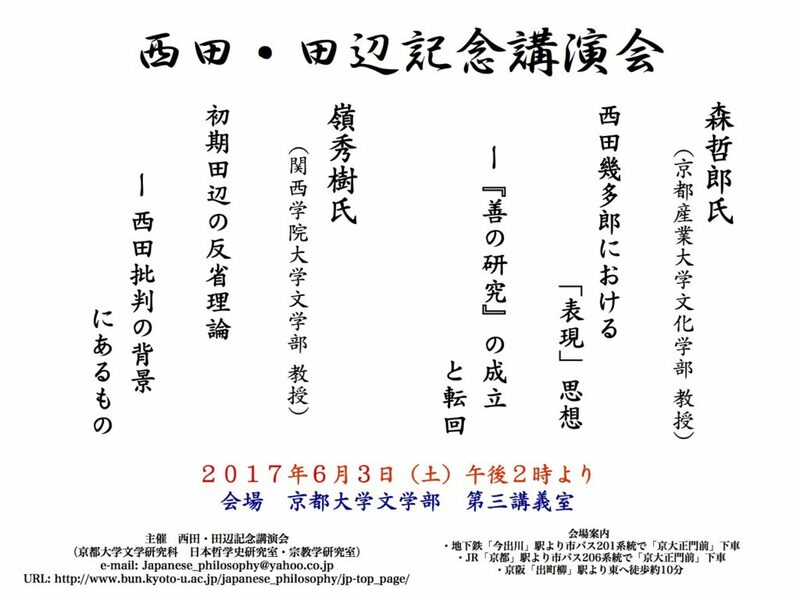 All submissions should be sent to tetsugakuconference@gmail.com on or before 15 March 2017 (Japan Time). 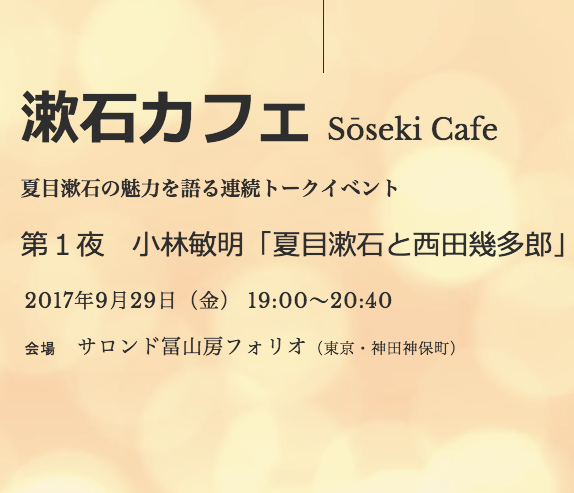 © 2014 - 2019 日本哲学史専修 All rights reserved.